Carrier Bale Picker Loader Machine is designed for picking the bales prepared and left on land by bale machınes and loading them to directly to trailer, lorry or truck. 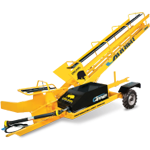 The machine has hydraulic system; this allows stowing bale up to 430 cm height. You will be able to align the bales in layers. All bales whatever side and position with two or three strings can be taken through the leading system on the machine. Therefore, there is no need any person to lead or amend bales. The machine transfers the bales through holding chains, carrier chain transfers he bale to the farthest point of the trailer. The machine is connected to tractor by drawbar system and can take position pursuant to work and road situation. Carrier specially designed for long years of using without any extra maintenance cost except for simple routine care and maintenances. Çelikel mainly consider the bale traders having big load and shipment quantity / capacity of bales instead of individual user for their own needs while designing. So, the first criteria is high performance and durability of the machine. Chain system specially chosen and preferred by Çelikel is so durable and long lasting system which doesn’t need any extra maintenance but only lubricating. Chains are used for picking the bale and loading to trailer. Chain system includes 4 different chains. 2 of them taker and 2 of them loader. 2 Taker chains gives the bales to the 2 loader chains. Then loader chains transfer the bales to trailer, truck or lorry. While Carrier is running, Carrier exposed to some force and load burden because of loading and picking of the bales. Not to have any problem or breakdown for these reasons, Carrier is comprised of strong bearings and gears made of specially designed steel. These gears and bearing are user friend product does not need any extra maintenance other than lubricating. Two pcs bale stabilizer system is to prevent any kind of lose for products by eliminating possible damages during picking up and loading process. Transmission system ; transferring the power from tractor to gears, is designed simply and functionally. CELIKEL adopted hydraulic piston system to Carrier to work with different kinds of trailers. By this system, carrier can easily reach to high level loading for all kinds of trailers. Carrier simply adjusted to sideways while working and to rear position while transporting it by movable pull system . One user can do this conveniently. For different kinds of trailers and hard land conditions, Carrier has adjustable trailer connector to shorten and lengthen. Till the 2012 only can be loaded to trailers by Carrier after detailed search and develop studies; now can load bales to any kinds of loading vehicle on the side ways such as trailers, lorries, trucks via new system equipment mounted on the Carrier. After mounting of the truck equipment, you can adjust the tire extension for left-right ways by loosening the nuts for balancing the machine. This system is designed for hard and rugged land conditions to prevent turnover. Carrier has 2500-3000 pcs loading capacity in 12 hours under normal circumstances. This numbers can be increased by the help of the worker placed on trailer to locate the bales. "Ben bu makineyi alalı 2 yıl oldu. Iki yıldır çok rahat ve istediğim verimi elde ederek çalıştırıyorum. Arazide 6 kişinin yaptığı işi tek başına rahatlıkla yapıyor. Traktöre yük olarak da ha varlığı ha yokluğu. Şimdiye kadar çalıştırdığım insanları boşuna yormuşum. Benden görüp almak isteyenler var. Şu anda dört kişi kesin alacak beşi geçtikten sonra toplu şekilde getirttirecekler. Bulunduğumuz yerin böyle bir kolaylığa ihtiyacı vardı. Aklına sağlık Çelikel."